Elephants are one of my favorite animals. They are calm, until they're upset about something. They're maternal, and have a matriarchal society. So here's my way of celebrating the mighty pachyderm. I found some odd little metal bits when I went on the road trip last July, and I have no idea what they're off. Some kind of agricultural machinery, it looks like. One of them is a blade, so some sort of cutting implement? Or an assortment of seeding plates? I don't know, but I do know that as soon as I saw them, I saw elephants. Burning up a bunch of old rotten boards, salvaging what I could to use for some craft or other guided me to saving some pieces of four by four lumber. Hubby cut them into varying lengths, under duress. Here's a guy who likes to measure and make sure everything is plumb and level, so he resisted my eyeball-and-cut method. 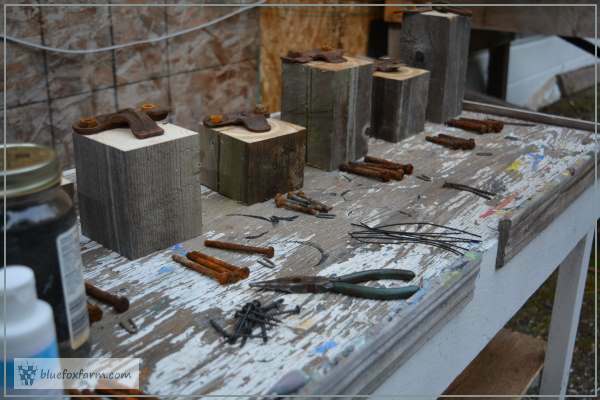 The pieces are weathered on the sides, but the freshly cut ends need some 'giggle juice' - see more about weathering wood with vinegar and steel wool here. To stay consistent with the nice silver grey look of the real thing, I've added some white acrylic craft paint to the vinegar mix to give it a more driftwood type appearance. Otherwise, it can go a very dark brown, which is fine too. 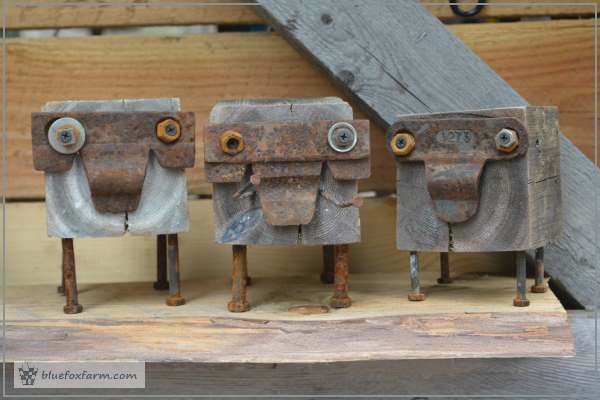 I found bolts in varying sizes, all nicely rusted for the legs. I predrilled the holes for the legs, and glued them in with Gorilla glue to make sure they don't come out. The tail will be a short piece of wire, twisted, and held on with a small fence staple. 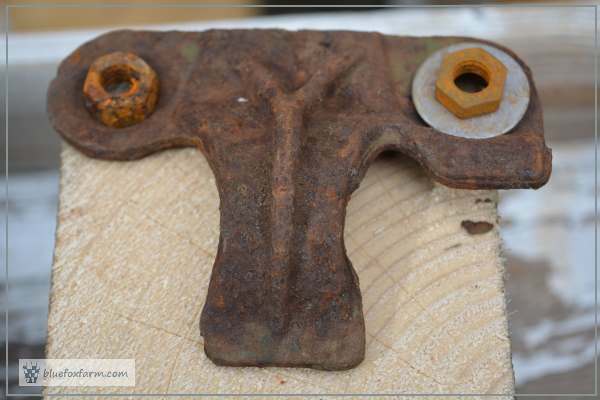 The eyes are different sized nuts, washers and other found objects. 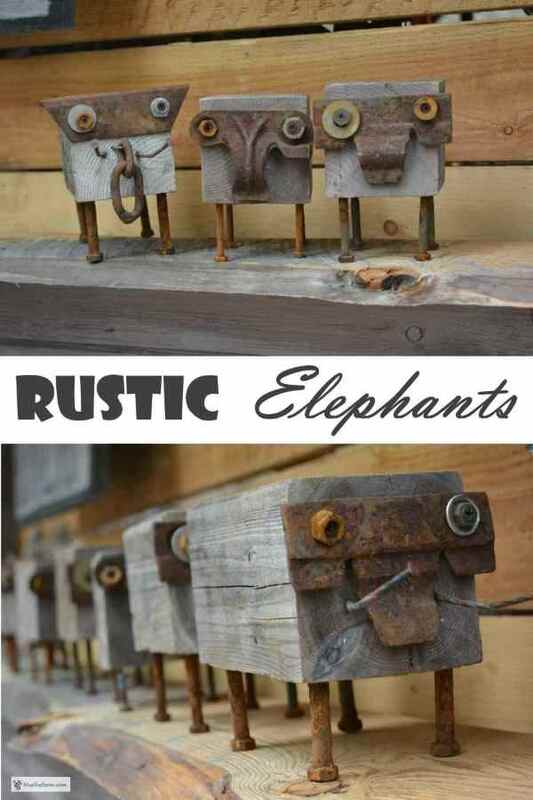 Does your garden or porch need a rustic elephant?